You’ve undoubtedly seen swim paddles at the pool before, as many seasoned swimmers use them. And now that you’ve been swimming for a while you wonder if you should get them too. Swim paddles are useful for correcting your arm stroke. You’ve figured out that they should allow to strengthen your shoulders and make you swim faster. But are they such a good idea? At the beginning of the pull, the arm and especially the shoulder are in an anatomical weak overhead position. Putting an additional load on the shoulder in this position isn’t such a good idea. Often, a swimmer’s stroke is far from perfect. Putting an additional load on the shoulder, in that case, can increase strain and lead to swimmer’s shoulder. There are far better exercises to strengthen the shoulders with dry land training than to use paddles. See for example the rotator cuff strengthening exercises and the scapular stabilization exercises. Water resistance increases exponentially with speed. So there’s a limit on how much speed you can gain by increasing your strength. It is far more easier and effective to work on decreasing drag than to increase strength. Swimming paddles aren’t allowed in competitions. So you have to learn to be efficient without them. With paddles, you swim fast without much effort and feel great. But when you remove the paddles you don’t feel so fast and great anymore. To feel how to anchor the hands in the water properly and to pull the body above them. If you want to use swimming paddles, make sure to use the smaller variants with holes in them. 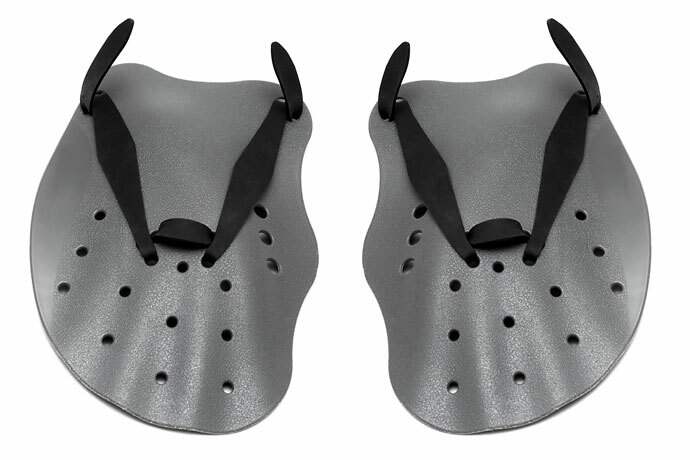 They put less strain on the shoulders and allow a better feel for the water. While using them focus on feel of the water and correct stroke mechanics instead of on force exertion.